The clothing retailer fell last month after enduring another painful quarter. Here's what investors need to know. 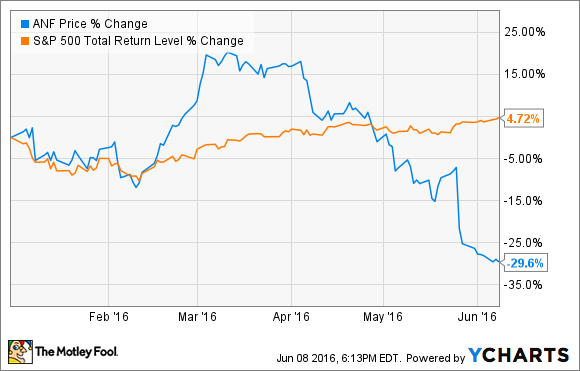 Hollister's comparable-store sales performance is helping prop up Abercrombie's results. Image source: The Motley Fool. What: Shares of Abercombie & Fitch Co. (NYSE:ANF) fell 25.6% in May, according to data from S&P Global Market Intelligence, driven by the clothing retailers disappointing fiscal first-quarter 2016 results. As of this writing -- and despite a reasonably strong start to the year through the beginning of April -- Abercombie & Fitch shares have fallen nearly 30% year to date, badly underperforming the S&P 500's modest 4.7% gain. So what: The bulk of last month's decline came the day after Abercrombie's report, which revealed that revenue fell 3.3% year over year, to $685.5 million, driven primarily by an 8% decline in comparable sales for the company's namesake brand. At the time, Executive Chairman Arthur Martinez blamed Abercrombie's painful performance on "significant traffic headwinds, particularly in international markets and in our U.S. flagship and tourist stores." To Abercrombie's credit, Martinez did highlight the fact that its Hollister brand managed to post flat comps, while Hollister's comparable-store sales in the U.S. demonstrated improvement despite the difficult business environment. Gross margin expanded 410 basis points over the same year-ago period, to 62.4%, and would have still climbed 100 basis points on a constant currency basis, driven by higher average unit retails. "Overall," Martinez added, "our business remains well managed in these challenging times, with our assortment and customer-centricity efforts driving improved conversion, and inventory well controlled." Nonetheless, on the bottom line, Abercrombie incurred a net loss for the quarter of $39.6 million, or $0.59 per share. Now what: But Abercrombie also offered a light at the end of the tunnel. Though comparable-store sales will probably remain challenging in the current quarter, Abercrombie anticipates that the metric will begin to show improvement in the second half of the fiscal year. Similarly, gross margin will suffer a modest decline in fiscal Q2 but should climb slightly from last year when all is said and done in fiscal 2016. In the end, it's hard to blame the market for taking a big step back from Abercrombie & Fitch shares last month, especially given its impending weakness in the coming quarter. But assuming Abercrombie can weather these headwinds long enough to realize its second-half recovery, shares could be poised to rebound over the next year. As such, while I'm not inclined to pick up shares today, I think patient investors could do well to at least add Abercrombie & Fitch to their watch lists.